A quick photo, which sadly isn’t the best. 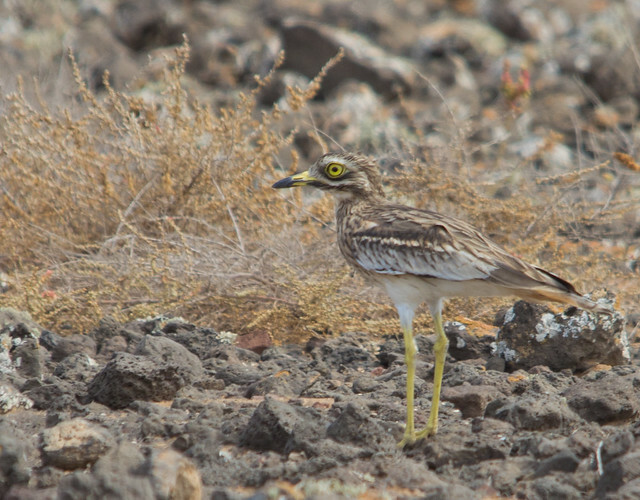 When I was photographing the cattle egrets featured a couple of posts ago, I flushed a bird, which turned out to be a stone curlew, something I had always wanted to see. I was right near the Northern edge of Costa Teguise, which was a surprise as I thought they were only found out in the wilder parts. Sadly where I saw it and the egrets will probably ahve been built on by next year. One mature male and two females seen feeding on open rough ground next to my house in Yaiza on 19 and 20 March 2016. Possibly en route to UK?